Do your weekend plans include brunch? If so, consider swinging by On the Border Mexican Grill & Cantina for a buy one, get one free deal on brunch entrees. The restaurant’s brunch offerings include huevos rancheros, hatch green chile burritos and breakfast fajitas. There also is a pancake platter if you are a traditionalist. To view the complete brunch menu, click here. 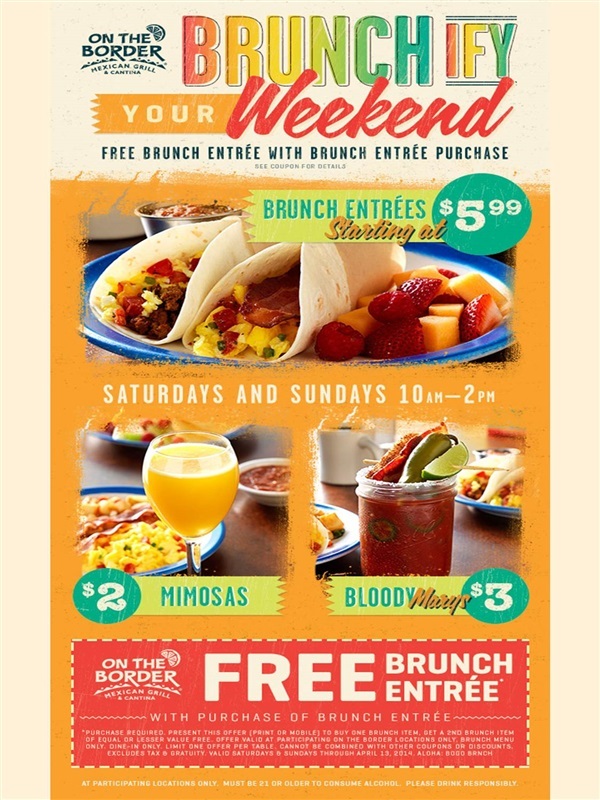 On the Border serves brunch between 10 a.m. and 2 p.m. on Saturdays and Sundays. Entrees start at $5.99. To enjoy the BOGO brunch offer, simply print this coupon or show it on your mobile device. The coupon is valid through April 13. Some restrictions apply, including that the offer is dine-in only and limit one per table. Free cheese fondue at The Melting Pot. BOGO breakfast sandwich at Del Taco through April 2. Fur real! American Eagle launches dog line called ‘American Beagle’.